Crowdfunding is a method of acquiring funds from investors from across the globe by using Internet technology. The basic idea is to offer one of two things to investors; either rewards for investing money into businesses or shares in the businesses. 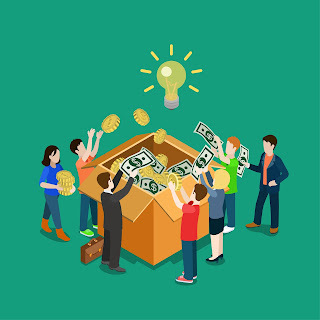 Some crowdfunding sites offer options for short-term projects and are aimed at generous people who are passionate about their type of business. Other sites look for investors for long-term business ventures. Although still a relatively new method, Crowdfunding is fast becoming more than just a rather recent entry into the business of obtaining funds for business ideas and projects. A specialist crowdfunding research company called Massolution reported steady growth in the industry. According to Massolution, crowdfunding generated over US$2.7 billion with more than a million campaigns across the globe in 2012 - and these numbers continue to increase every year. Sir Richard Branson once told a British newspaper that crowdfunding would have been his first choice if it existed in the sixties when he started the Virgin empire. • If your project is on the creative side, try Indiegogo or Kickstarter. Other successful crowdfunding sites include MicroVentures, CircleUp and Crowdfunder - to name but a few. Just Google 'business crowdfunding'. • Keep abreast of changing rules. Federal and SEC regulations change, as do crowdfunding site rules. For a smooth campaign, it is important to know what the authorities and the platforms expect from you. • Be aware of the risks involved. Some sites will only facilitate the funding if your target is reached. So if you hope to raise US$10,000 and you have US$9,800 pledged - you can forget about it. Another obvious risk is that your idea may be stolen. • Find your best fit. By reviewing the rules and campaigns on several sites you can determine which one will best suit your efforts. • Don't make your business plan too heavy. Former head of Indiegogo, Adam Chapnik suggests that you should create a big plan, and then throw it away and make a simpler version. Business plans are optional on some of the sites, where questionnaires are preferred. While these tips can whet your appetite to get your goods out there, and help you to take the first step, there is a lot to learn about the industry. The best tip money can't buy is simply to research and network. The more you learn and the more time you spend with like minded individuals, the more likely your campaign is of success.